Welcome to the dog days of summer! I realize it has been over a month since our last post, so I wanted to share a little bit of what we have been working on. 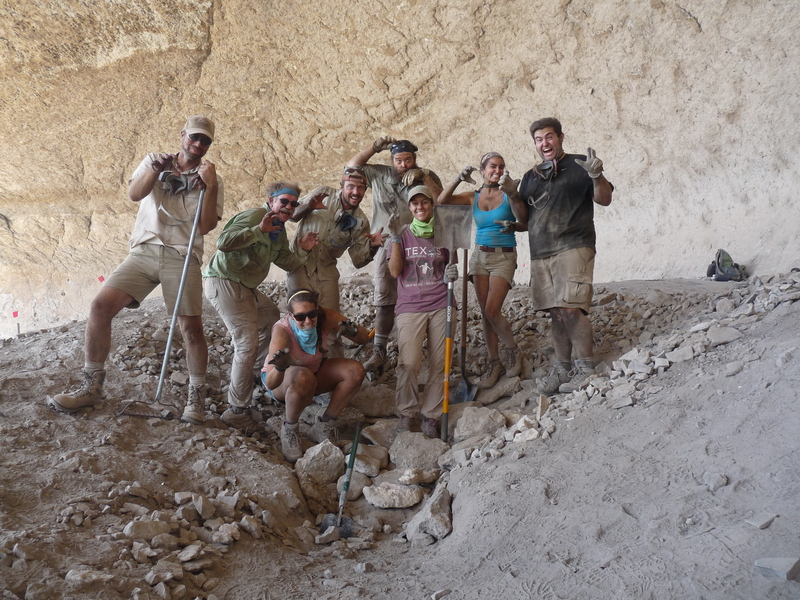 The crew standing on top of the UT north unit in Eagle Cave after it was backfilled. Since the flooding at the end of June, we were able to wrap up our excavations and finish backfilling all of our excavation units. Once we got back to San Marcos, Steve and I were faced with the realization of how much data we had collected: nearly 900 GB of data (including over 50,000 photographs), several hundred 3D models (we still have not counted exactly how many we have), and thousands of TDS points. So, what we’ve started doing is focusing on bringing together all the spatial data (specifically 3D models and TDS data) from each of the sites. As we’re doing this, we’re beginning to experiment with creating fly-through animations of the 3D models. The first animation we have created is of Skiles Shelter prior to any excavations. This is the first-draft of this animation, but I wanted to give people an idea of the direction we’re going with the 3D data. In the animation, there are actually 2 different 3D models: one of the shelter and one of the talus. The shelter was photographed in 2013 prior to the field school, and about 2500 photographs were used to produce the model. When we started working at Skiles this past spring, we mapped the talus in order to estimate the volume of FCR on the slope in front of the shelter. Because the vegetation was so thick, we decided to clear narrow “senderos” down the talus (the narrow “strips” extending downslope in the 3D model) rather than clear the entire talus. The talus was photographed using 2 canon point-and-shoot cameras attached to the end of a pole (see SfM blog post from January), and the model was created from about 300 photographs. The difference in lighting between the shelter and the talus is due to the each location being photographed at different times and with different lighting conditions. As we continue to bring all of our spatial data in order, we will create more 3D animations. Eventually, the goal is to have all the 3D data put into a digital environment where people can navigate between the sites, as well as explore the sites in their own way (rather than being limited to watching an animation). Excellent 3D animation of Skiles Shelter – I continue to be impressed by the great work that is being done by this crew! Looking forward to seeing more as they become available. That’s a pretty good use of some of the 900Gb of data.